The Farmhouse at Le Roc accommodates eight people comfortably. The white stone building, typical of the area, has been carefully restored to retain its original character and features. The Farmhouse ground floor comprises a sitting room, a television room, a formal French dining room, a large Farmhouse kitchen and a utility room. There is also a WC and separate shower room. The rooms are all spacious and tastefully furnished. A dishwasher, a washing machine, a fridge, a freezer, English TV, humax, dvd and CD player have all been provided. There is also a broadband internet with Wifi connection. Endless books, tourist information, maps and games are at your disposal. The first floor comprises 2 large double en suite bedrooms, the master bedroom having a large walk in shower, bath, marble fireplace, twin basins and w.c. There are 2 further large twin bedrooms and a further bathroom with large walk in shower. The Farmhouse benefits from an exterior summer dining room with views out across the decking and rolling countryside. A further large dining table in the courtyard with adjacent BBQ area, with olive trees and herbs.. Enjoy watching the sun set from the glorious decking and later feast your eyes on the myriad of stars. There is a large, shared pool measuring 16m x 6m, set into the hillside. 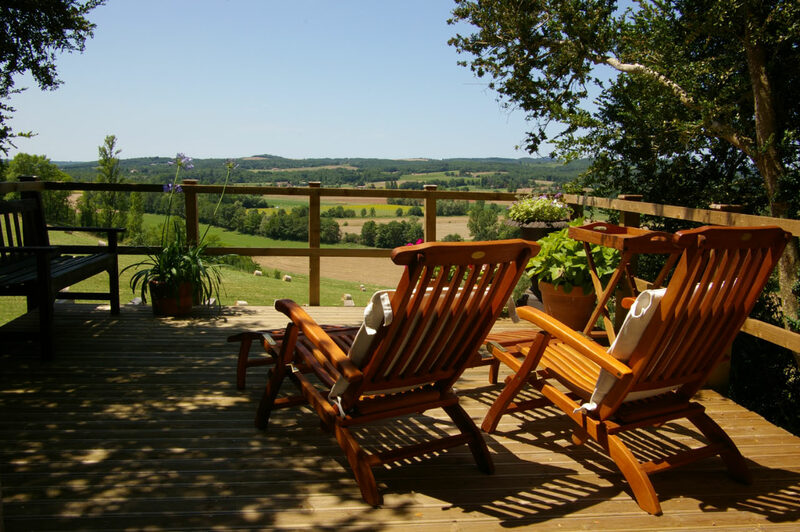 The pool enjoys a tranquil and secluded position away from the accommodation, with stunning views across the valley of the River Vere and Grésigne Forest. There is a changing room with a WC and washbasin. Le Roc has breathtaking panoramic views in all directions across its 30 acres of grounds and farmland.